Vacation dollars and days go farther since American Airlines started their Family Fare Plan. Now Dad can take the whole family on a big trip… He pays full fare while Mother and the children go for half when they travel on Monday, Tuesday or Wednesday. Is it any wonder family men are so enthusiastic about Flagship travel? And, Mothers, too, welcome this new and easy way to go places with the children. Miles melt into minutes… no more restless, tired youngsters to worry over. Meals are delicious and come to you… no waiting, no fuss. This year plan now to go where you please by Flagship and save as you go with American’s Family Fare Plan. Attention to detail: not only is the tail of the Convair accurately drawn, but that tail number actually belonged to an American Airlines Convair. Looks like they must have just come from church where they prayed (no doubt) for a safe delivery. 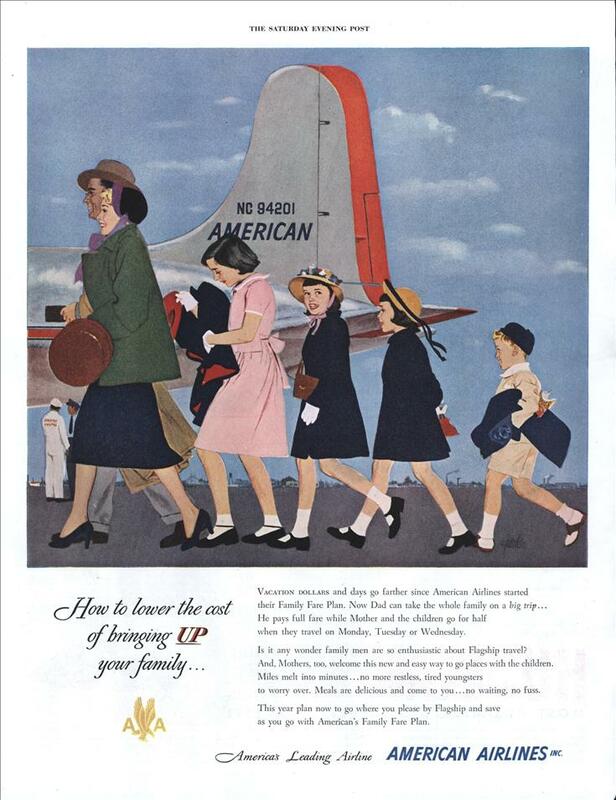 No, people just used to dress up when they flew on an airliner. That’s the truth, as a son of a former United Airlines pilot, there were company dress codes “dress to travel First Class,” we had to follow when traveling on passes. However at that time the principal customers were celebrities, white collar and executives who always dressed like that for work. Today, the super rich fly their own private jets. John – you missed a comma. I think you mean to write “No, people used to…”. KH: Heck, I used to “commute” to a job in Vancouver from Toronto, flying in about 3-4 times a year (and telecommuting in between.) Not only was it company policy to wear a suit to fly, but it really ups your chances to get a bump-up to a better class. On a 5 hour flight, that can make a huge difference. This is true. In those days, if you could afford to fly you could afford to dress like that. The average person could do neither. I old enough to remember that I wore my little boy suit and tie and my Mom and Dad were always dressed in “church clothes” when we flew; of course those were DC-7’s!